It is getting colder tonight, but we are making good progess and having a great time at the World Ice Art Championships. We've had to abandon our plan A design (and even plan B) due to a variety of problems including gear cutting difficulties and poor ice quality. We had one large gear mysteriously break over night, perhaps due to cracks in the original block. Our block has many cracks this year. I guess this year's ice just isn't that great because we've seen other blocks that are much worse than ours. We have made some small gears successfully, and we are well on our way toward completing an alternate design. Most of our new tools have performed admirably this year, and we'll continue to use them tomorrow until the horn sounds at 9:00 PM. The Single Block Classic began at 9:00 this morning, and we are carving our block to bits! We are on camera this year. Check out the web cam for our site throughout the next three days, or stop by for a visit if you are lucky enough to be enjoying the Fairbanks winter. The temperature is currently slightly above 0°F, which is much, much friendlier than last year. As of Tuesday lunch, we are on schedule. Unfortunately it has been more difficult this year for me to get photos online, but the web cam should fill the gap a bit. Also, Dan is here taking a lot of pictures again, and I'm sure he'll be happy to share some for the blog when we have a little time to devote to the project. So far we have sliced off a new face on the front end of our block and taken three slabs out from the rear portion. We've also marked axle hole drilling locations on the front face that is quite planar thanks to the chainsaw guide rails that Lars bolted right into the ice. This afternoon I'll be roughing out the gears and flywheel while Lars gets started on the axles. The lathe is just to the right of the web cam view, but we'll see if we can get the camera position adjusted. Alas, the computers at Ice Park are not in very good shape, and they fail to handle USB mass storage devices correctly. I was hoping that a little CF/USB adapter would allow me to get photos from my camera to the blog in record time. Oh well. We have registered and are about to check out the condition of our block. We are site number six. Who is number one? Ice madness has descended upon Belfair! It was here long before my arrival as is apparent from the array of new equipment Lars has constructed this winter. We didn't do much on our first night other than show off various gadgets and tools to each other. My Denver friends will be horrified to discover that I spent the night in a bed with an Oakland Raiders blanket. I didn't see it until morning. Honest. I checked my two 49 pound bags and headed for the metal detectors. "What is in here?" the TSA lady asked. 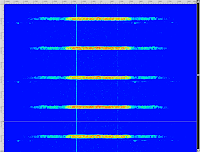 "Oh, you're probably looking at the variable transformer. It is very heavy." She turned down my offer to help carry the bag to the inspection table - protocol I suppose. "What is this again?" "A variable transformer, like the AC adapters you plug into the wall, only bigger, and with a knob." "You wouldn't use something like this in the home, would you?" "You could, but mostly they are used in more industrial settings for testing electronic equipment and any other time you need fine control over voltage." "So this thing is high voltage?" "Only if you plug it into a high voltage source, like that socket over there." Once I told her that guitarists sometimes use them to adjust the tone of old electric guitar amps, she finally warmed up and decided to let me on my way. Maybe she is a music lover. After a short night of sleep, I'll be on a plane for Fairbanks. It will be nice to meet up with Dan, Brian, and Tamara (the documentary crew) in Seattle as we all ended up on the same flight to Fairbanks. Here's hoping the TSA doesn't find my gear too interesting. . . Although our task list for the next few days is daunting, we are making great progress in our preparations for Ice Art 2008. Lars has finished building a trailer that will help us transport all our equipment and will also provide a relatively warm environment for heat cutting should the weather be extremely cold. He has also been hard at work on drill bits, the slab machine, and various other tools. I started and nearly finished the drill laser guidance system tonight and have a few other projects to finish (not the least of which is packing!) before heading to Fairbanks this Saturday. The weather in Fairbanks has been unusually warm lately - so much so that Lars has had difficulty testing tools because of temperatures above freezing. It is supposed to cool off this weekend. With any luck, the forecasters will be right and we will have highs in the teens next week. Since my last post I've learned that augers with their screws removed are called barefoot augers. They are rare but not unheard of. Since Lars had complained of the screw on a new auger of his that we hope to use, I suggested that we could turn it into a barefoot auger. It turns out that he already had a better idea! He is fabricating a pilot spade bit that will screw onto the auger's feed screw. I think this is a great idea and can't wait to see if it works. If it doesn't, then we can always resort to hacking off the screw. 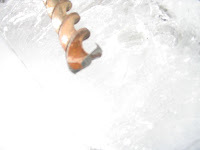 Augers have long been used for boring holes through ice, but it is difficult to find an ice auger smaller than 6 inches in diameter. There are plenty of smaller augers for wood boring, but they top out at around 1.5 inches. Even so, we plan to use at least one of these. 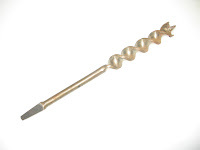 Wood augers have a screw tip designed to pull the bit into the wood. Unfortunately this doesn't work at all in ice, so I did some experiments today to see if a wood auger could be modified to work in ice. I started with an old 3/4 inch auger that I picked up at a thrift store. It wasn't completely useless in ice, but I'd rate its performance at only about 40%. Not having an old brace, the first thing I had to do was hack off the square taper shank. Then I ground off the screw tip and what I'll call wings on the outer edge. I'd say that at best it only performed at about 5% in this condition. It was pretty bad. 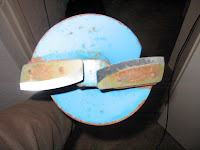 I decided to compare it to a 6 inch hand cranked ice auger (for fishing) that I picked up on ebay a few months ago. I was worried about the flat center of my modified auger; it seemed that flat section was just pushing in vain against the ice. The 6 inch ice auger has a fairly small gap between cutting blades at the center, so I decided to try to cut a gap in mine. I cut a groove across the center and tried it again, but I didn't notice any improvement. In hindsight, I think that these first couple of modifications may have resulted in a curvature that cause the cutting edges to not be fully in contact with the ice. I didn't notice that at the time, but I decided to try a more aggressive modification to get the cutting edges closer to the center point. I removed quite a bit of material from the end of the bit and completely reshaped the cutting edges to look similar to the 6 inch ice auger. This time the results were excellent. I'd rate the performance at 80%, and the only thing keeping me from calling it 100% was that it was a little hard to get started in a precise spot. I think this is a worthwhile modification, but the loss of control when starting a new hole is a concern. I think the ideal shape would have a small triangular spade tip instead of a larger screw tip. Unfortunately the hot wire cutter I have spent so much time on isn't going to make the trip to Fairbanks this year. Even though the project has been somewhat successful, we decided that the method isn't fast enough to use for this year's sculpture. So far my fastest cuts with the device have been at a rate of about three inches per minute. The only task we had in mind for the hot wire cutter this year was cutting discs (the flywheel and gear blanks). At three inches per minute it would take well over two hours to cut all the discs we require. Instead of using the hot wire cutter, we will use the table mounted chainsaw for this task. We haven't completely given up on heat cutting. On the contrary, we intend to use hot wire gear cutters similar to last year's model but sturdier. The power supply that I have partially constructed for the single wire cutter will be put to use for this purpose. I expect that future improvements will make the single wire cutter and/or the boiler useful tools one day. The only thing that will prevent our sculpture from running for a very long time is friction. Without friction, the momentum of the flywheel would lift the half gear all the way up to the full starting position repeatedly. Making a working model of the machine out of some other materials won't help us figure out how long the finished product will run (or if it will oscillate at all) because the friction is highly dependent on the materials and scale of the piece. We've turned instead to computer simulations. 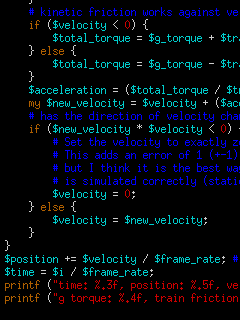 I had a perl script from two years ago that I used to calculate the moment of inertia of the clock's gear train, so I started with that and added a simulation loop. Modeling friction was the hardest part, but I think I have a reasonable approximation of friction's effect at this point. It accounts for the weight of the various components as well as the gear separating forces (spur gears tend to push away from each other as one drives the next), but my values for the coefficient of friction at various speeds are somewhat questionable. 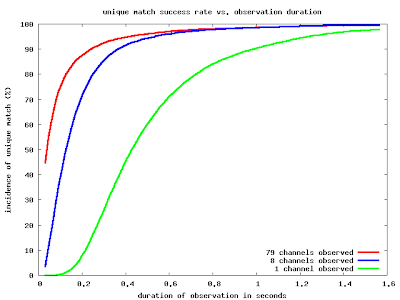 With a few modifications based on these findings, our simulated running time has increased from 45 to 105 seconds. I was excited to find the 16 gauge nichrome in my mailbox yesterday and quickly put it to use. It seems to do the trick! After my first test cut I thought my multi-meter was starting to smoke, but it turned out to be a wire draped across the multi-meter. I was overloading the wire going from the power supply to the nichrome. I should have thought of that! I quickly replaced it with some 14 gauge copper, but even that got warmer than I would like. I'll have to get some lower gauge connecting wire soon. Even though the new nichrome worked well at high power and showed no signs of failure, cutting through ice wasn't exactly speedy. It should go a little faster once I reduce the connecting wire voltage drop with fatter wire. I'll also soon have air cooling for the power supply which should allow for close to 2000 Watts. One of the ways we hope to improve this year is by sculpting subtractively rather than additively; instead of assembling a sculpture entirely out of individual parts that we have produced, we'll carve most of it out of a solid block. There will be parts, like gears and axles, that we will have to add, but the bulk of the piece will be carved, not assembled. Our hope is that this technique will allow us to create a sculpture faster, with improved aesthetic value, and with better overall use of ice. The technique does come with drawbacks, however, the principle one being the difficulty of boring holes for axles. This problem was one of the major reasons we decided to use the additive method in the past. We thought that the best way to drill the fairly large (3.5 inches usually) holes for axles would be to use a drill press on individual frame segments and then assemble those pieces together. The drill press does a good job of boring very straight holes, even with homemade bits, perfectly perpendicular to a slab of ice. Then it is simply a matter of aligning those slabs correctly when assembling the frame. Unfortunately it has turned out to be slower and more difficult than we originally anticipated to execute this process. In order for the frame pieces to be assembled with perfect alignment, many pieces must be produced, each piece must be very precisely shaped (more precisely than can be done with a chainsaw), and a lot of watergluing must be done. Turning to the subtractive method brings back the problem we at first sought to avoid: How do you bore 3.5 inch holes through two feet (or even more) of solid ice while keeping the hole perfectly straight, level, and parallel to an adjacent hole? Some weeks back, I was discussing the problem with Dan, and he had an intriguing suggestion: lasers! 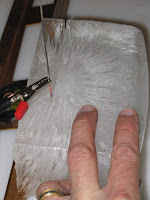 By mounting one or more lasers on a hand drill and marking a target on the far side of the block of ice, it should be possible to keep the drill precisely on the correct path by aiming the lasers at the target. I loved the idea because it is simple and takes advantage of the transparency of the medium. 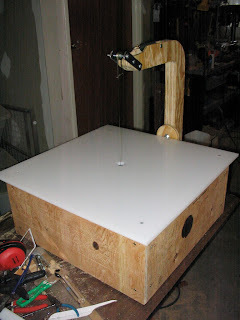 It is certainly worth trying as it is much easier than constructing some sort of deep-boring, horizontal drill press. This is the technique that Lars and I intend to use to bore axle holes in the frame of our sculpture this year. Fortunately, Lars was smart enough to point out that the method can only be used at the precise angle perpendicular, or normal, to the ice surface where the drilling begins; otherwise we would have to account for refraction of the laser beam when placing the target on the far side of the ice! 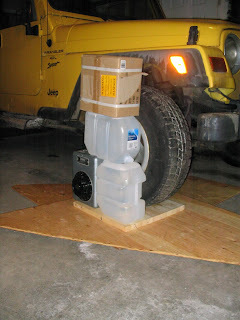 Lars and I plan to build a sort of perpetual motion machine for the 2008 World Ice Art Championships. This is a simplified diagram of the mechanism, notably missing gear teeth. The big red thing is a heavy half gear that powers the sculpture. It is shown here nearly at the starting position. The weight of the half gear pulls it downward, turning the little red pinion as it goes. The red pinion is connected to the large yellow gear which turns the yellow pinion. 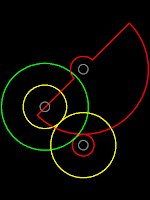 The yellow pinion is connected to the large green flywheel. Once the half gear completes a quarter turn to the bottom position, the flywheel should have enough angular momentum to keep the half gear moving until it slows to a stop opposite from its starting position. With any luck, the half gear will be high enough that gravity will pull it back toward the center position, repeating the whole process in reverse. 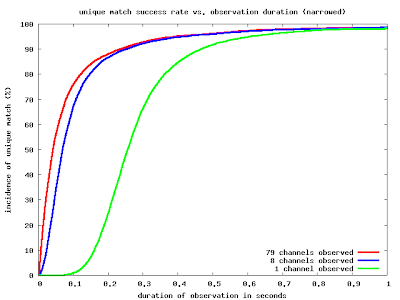 Our goal is to produce oscillatory motion that lasts for as long as possible, perhaps a few minutes. Good news: I was right about transformer winding selection. I switched to the heavy gauge secondary winding, and all is well. I can now crank the thing up as high as my household circuit breaker allows. Bad news: As I feared might happen, the cutting wire became brittle at high temperature and snapped during my first test at a higher voltage! 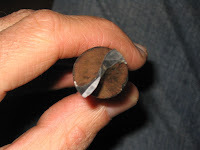 In anticipation of this problem, I had prepared a quarter inch copper tube with a length of nichrome wire running through it, electrically insulated by a high temperature fiberglass sleeve. 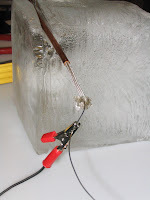 The idea, suggested by Lars, is that the tube, not the wire, bears the brunt of the ice pushing against it (stainless steel would be ideal, but copper was fine for testing). 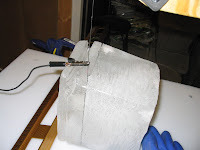 This certainly allowed the wire to get very hot; I could see it glowing brightly right through the fiberglass sleeve! It even left a couple of black marks on the sleeve. Unfortunately, it didn't produce enough heat to cut at a useful speed due to the wide swath of ice that must be melted for the tube to pass through. Maybe a narrower tube could be used, but I haven't found a smaller high temperature insulator to keep the current running through the wire and not the tube. Then I tried a new length of nichrome in the original setup to see how it works at lower voltage. I adjusted the tension somewhat lower too. I was able to cut at a reasonable speed (at least two inches per minute) with 14V across eight inches of wire, but I had another breakage when I turned it up to 16V. It cuts more slowly than I had hoped, but it is certainly usable. Two inches per minute may sound quite slow, but I believe it is faster than the boiler we used last year with some success. The benefit of this technique is the ability to make precise, intricate cuts that are perfectly perpendicular (or at some consistent angle) to a surface of the workpiece. For many mechanical parts this benefit could outweigh the slow cutting speed. 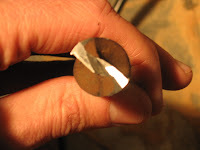 Next I would like to try a lower gauge cutting wire which should fail at a higher power level. My guess at this point is that the tension doesn't matter much (the second break happened under very little tension) but that the breakage occurs due to the wire becoming so brittle at high temperature that very little physical stress causes it to break. The failures tend to be located at the hottest part of the wire, between the ice and the alligator clips that deliver current. I'd also like to try to minimize that gap, but it can't be completely eliminated. I am in awe. This guy built a working bicycle entirely out of wood. Having just received a new transformer in the mail, I was able to piece together a first attempt at a new power supply tonight. This allowed me to properly test the hot wire cutter for the first time. I am happy to report that it sliced through a block of ice quite easily. I had it up to about half of (theoretical) maximum power, and it cut as fast or faster than any hot wire I have used to date. This was the first time I have ever seen 19 gauge nichrome get red hot. I was afraid that it might become too brittle when hot and snap under the tension, but it remained intact. Unfortunately I had to cut my test short because the new transformer started making ominous crackling noises and then started to smoke a little bit! The unit is rated for 2000 Watts, but, in hindsight, I think that rating is only for one of its secondary windings. It has a primary winding of heavy gauge wire rated at 100V, a secondary winding of the same wire at 95V, and various lower voltage secondaries from 15V to 30V. I plugged in a variac with its variable tap connected to the new transformer's primary winding and attempted to use one of the lower voltage taps to power the hot wire at 0-30V. It started to crackle at about one quarter power and smoke at half. I think my problem was that the winding I used does not have thick enough wire for my power level. Instead of using the new transformer to step down from high to low voltage, I'll just use a lower voltage tap on the variac and use the 95/100 tap on the new transformer for isolation. I got the new hot wire ice cutter mostly finished and in testable condition the other night. Unfortunately I am still missing one part needed for the power supply, but I was able to perform an initial test with a much weaker power supply from last year. Since the new device uses a very short length of low gauge wire (compared to the gear cutters of last year), it draws much more current. I hope to take advantage of this with a new power supply in the neighborhood of 1500 Watts for faster cutting, but for now I have to use my old power supply at very low voltage to prevent overheating of the transformer. It works, very slowly. 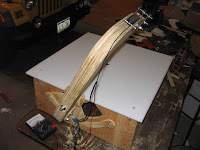 The device is made mostly of plywood with a 24 inch square piece of HDPE for the work surface, 19 AWG nichrome for the cutting wire, and assorted hardware. 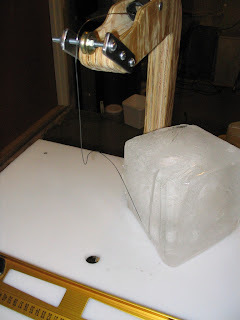 It should support the wire with enough tension to keep it reasonably straight while ice is pushed against it. So far I've cranked it up to 20 pounds of tension, but I think it will handle twice that. The cutting angle is adjustable to 45 degrees to either side. I still need to add an adjustable fence and rulers for the fence position and cutting angle. My sheet of UHMW was nicely planar, but it had small grooves in concentric arcs left by some sawing or milling covering both sides. 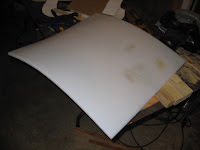 I thought it would be a good idea to make the working surface as smooth as possible, so I tried sanding it. No dice! One of the properties of UHMW that makes it attractive for its many uses is extreme abrasion resistance - it out-wears steel 10 to 1! It should be planable, but I only have a mini hand plane, so that didn't work very well. Then I thought I might be able to smooth out the grooves with a propane torch, like finishing ice. Bad idea! The process did work somewhat as intended, but it also slightly discolored the surface and, worse, caused major warpage! It turns out that UHMW has some pretty strong internal stresses originating from uneven cooling at production, and those stresses result in warping when it is heated near the melting point. I tried to flatten the piece by heating the whole thing up and then letting it cool slowly while being held flat by heavy things. Unfortunately, it didn't work. In hindsight, I should have just left the grooves. I doubt that they would have been much of a problem in the first place. I decided that having a flat piece of plastic was important enough to warrant buying a replacement, so I took another trip to Colorado Plastic Products to rummage through the scrap bins. I couldn't find any UHMW scraps of the correct size this time, so I settled for some HDPE. I'm pretty sure it will work just as well for my application, and it is quite inexpensive. The very cool Automata / Automaton Blog points out a neat book, Make Your Own Working Paper Clock. "Cut this book into 160 pieces, glue them together, and have a paper clock operated by weights that keeps perfect time and can be rewound and regulated." One of our guiding principles this year is simplicity. We want to make a working mechanical ice sculpture, but we want the design to be simple enough that we can actually build it without compromising the design during construction. One way to gauge complexity is by counting mechanical parts such as axles and gears (I'm not counting bushings). In our first year, we attempted to build a mechanical ice sculpture with 25 mechanical parts (9 independently moving assemblies). We failed but managed to assemble 6 mechanical parts (2 independently moving) almost functionally. In our second year, we attempted 22 mechanical parts (11 independently moving) and succeeded in building a functional mechanical sculpture of 5 mechanical parts (2 independently moving). This year we hope to construct a sculpture consisting of only 8 mechanical parts (3 independently moving). I think this is an attainable goal. With the experience we now have under our belts, I believe we can produce a few more working parts than last year. Although Lars and I are very excited about Ice Art this year, we somehow have failed to find time for as much preparation as we had the last couple years. We even forgot to register for the event until a friend reminded us! Fortunately we were able to get one of the last spots in the single block. Both of us are working on tool preparation, of course. I'm primarily working on a new hot wire cutter while Lars is attempting to resurrect the ill-fated bandsaw of 2006. We are both working on improving our arsenal of chisels. I guess it's time to wake up and start blogging.